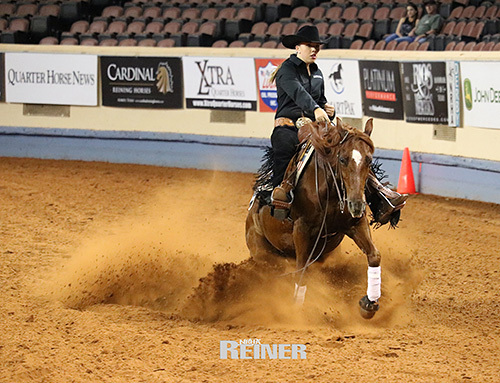 For Immediate Release – June 30, 2016 – Oklahoma City, Okla. – Riders from three different organizations battled head to head tonight in the Jim Norick Arena all in hopes of being crowned the 2016 National Reining Horse Association (NRHA) Collegiate Catch Ride Champion. Four riders from the National Collegiate Equestrian Association (NCEA), four riders from the Intercollegiate Horse Show Association (IHSA), and four riders from NRHA competed on catch ride horses for bragging rights. Riders drew their horses at random the day prior to the competition.